The FDA announced today that Sabra is voluntarily recalling 30,000 cases of its Classic Hummus due to Listeria concerns. 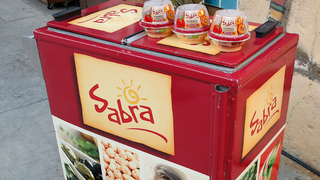 The Daily News reports “Sabra discovered the possible Listeria contamination during a random March 30 sampling at a Michigan store.” Yikes! So spit that sweet, sweet, Sabra Classic Hummus out of your mouth, throw the tub out the window, and scream until your neighbors start complaining. Once you’ve cooled down, whip up some homemade hummus on your own! It’s even easier than all those “You Won’t Believe How Easy It Is To Make Hummus!” blog posts would have you believe.